allround geek: Quake Live: The free digital sport of tommorow, today! Quake Live: The free digital sport of tommorow, today! Id software is known inventing the FPS genre, for setting the standards of new graphics engines(and making shitloads of money ou of them) and for providing us games that stand the test of time. Id will now be know for the first massive digital sporting events and a new way of playing games online. Id has just offered [publicly the beta version of Quake Live, its "new" shooter game. There is a twist here. Quake live is actually quake 3, totally free and played directly through the browser! I know, it sounds crazy, but believe me, it works extremely well. Id is aiming to create a massive community of players that compete online through the id servers. This community has all the characteristics of a social network build around a single game, Each user has his/her own stats and profile friends and so on. Of course the re is glabl ladder for various statistics; most frags, most wins, most time played etc. You play the game through your browser. No, its not a java applet. Its a plugin currently available for the windows versions of Firefox and explorer. id has stated that by the time of release it will offer support for Linux and Mac OSX as well. You simply download the plugin install it and then login to the quake live website using your account. That's it. You can play this from everywhere with your own account as long as you have installed the plugin. Amazing technology really. The game offers the same, if somewhat improved graphics with quake 3 and it is blazing fast in even the lowest of the configuration. Quake 3 determines your skill level through the an initial game and then it continually evaluates you through your games proposing games with players of similar level as you. That way everyone has fun. Of course you can spectate other people's games and join any game you like including setting up private games for you and your friends. Why free? Is there a catch? Nope, there is no catch. Id is aiming at making money out of selling advertisement space in the virtual arenas. Actually it does not sound so strange. There are advertisement in football stadiums, basketball stadiums, so why not at quake arenas? If its not overdone and does not distract me from the action it I do not mind seeing a coca-cola advertisement with the blood of my opponent's character dripping from it. So what are you waiting for? 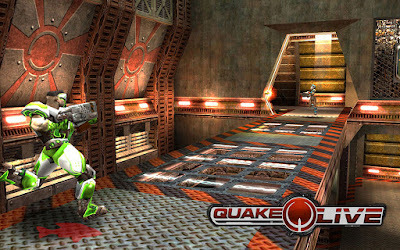 Go to the Quake Live website, create your free account, download the plugin and start shooting whatever moves. You might have to wait for a few minutes to be allowed in, now that it is open beta, but its getting better everyday. ps. This is the 100th post of Allround Geek!